Would you like to see our latest school room? 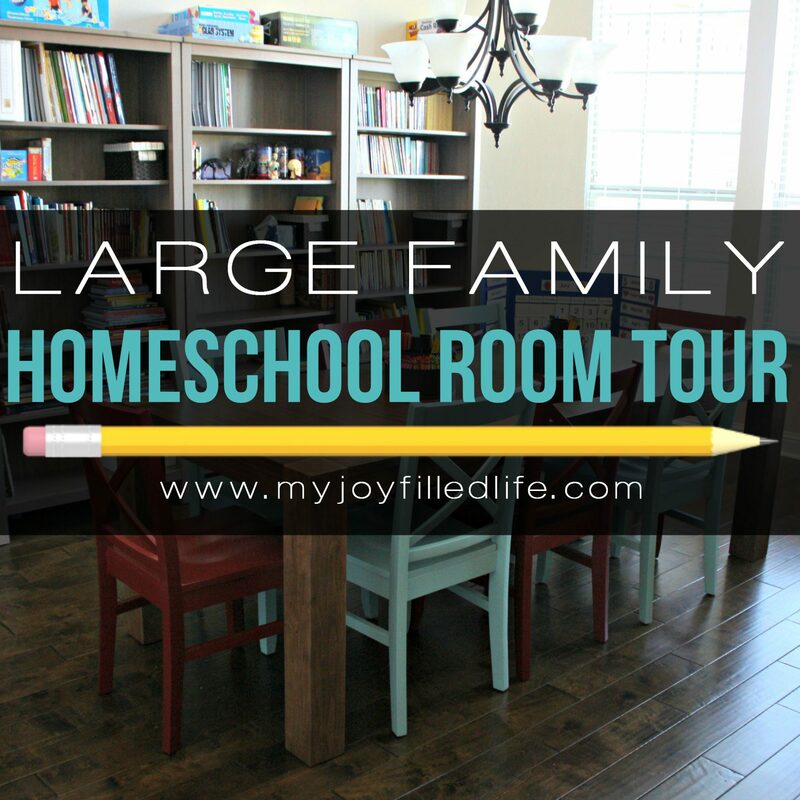 Last year, when homeschool bloggers were coming together to share their curriculum for the upcoming school year, their schedules, and their schoolrooms, my family was busy settling into our new home. I was bummed that I didn’t have a seamlessly organized schoolroom to showcase during all the blog hopping and carnivals that were going on at the start of the school year. 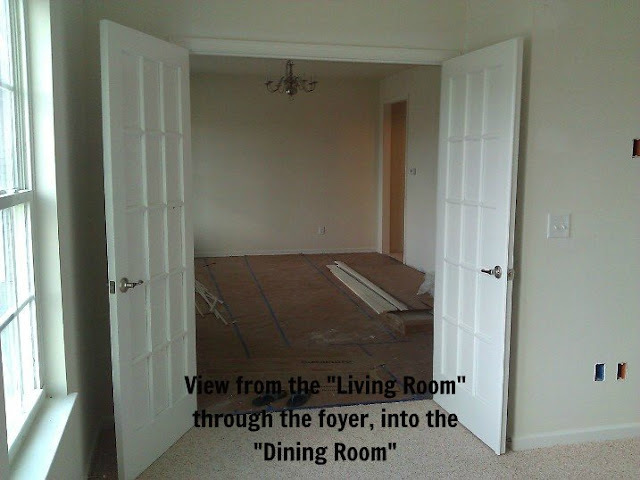 I participated anyways and featured the blank slate that I had to work with – our two front rooms, the dining room and living room. The school area has slowly been coming together over the past 6-8 months and I’ve been waiting, and wanting to do a “reveal” when the room was just right – perfect. Only that just wasn’t happening. I came to the realization that it will never be perfect. And ya’ know what else I realized? That, that’s okay! 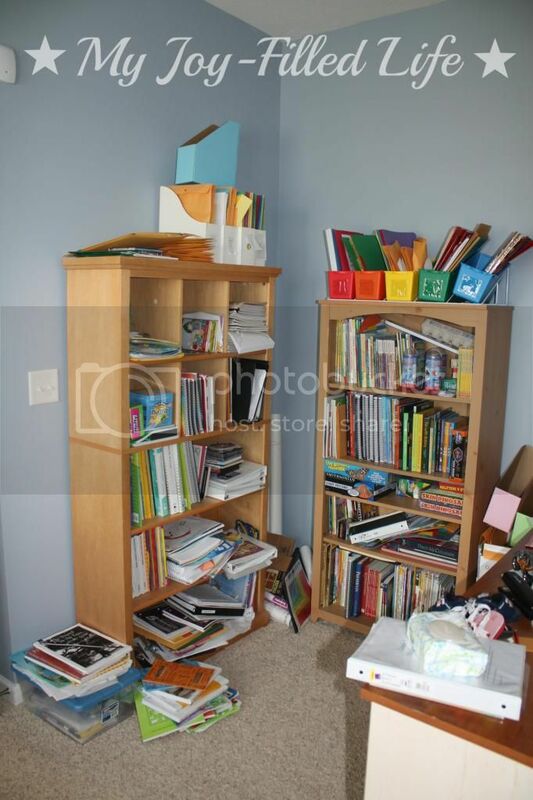 If it was perfect and everything was put away all neat in its place and untouched, then that would mean there was no learning going on in there, no living taking place in there. 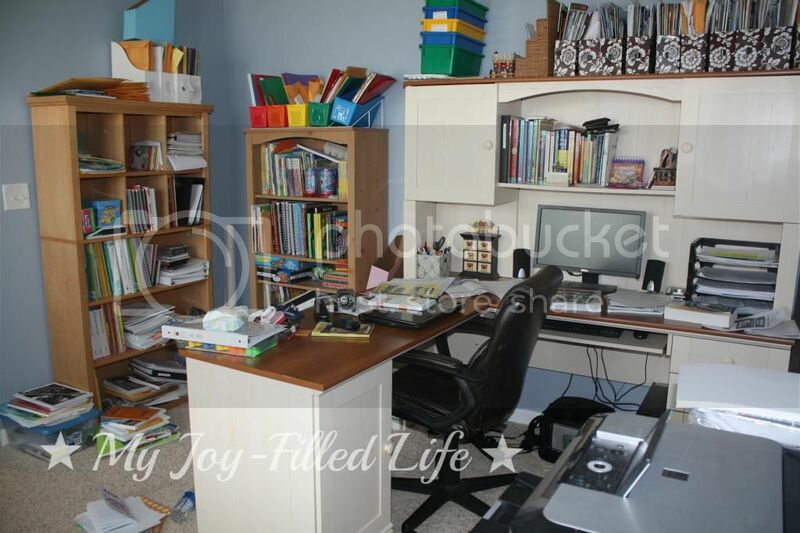 I want my schoolroom to be a little cluttered, a bit messy, with books and crayons out of their place. Then we are learning. Then we are experiencing. Then we are living. When we built our new house, our plan was to use the formal dining room and living room as the designated school area (who needs formal dining and living rooms anyway?). I cleaned the room just for all of you – that stuff was not supposed to be on the table for the pictures, but like I said, it will never be perfect and doesn’t have to be. The “dining room” is where we do most of our schooling – this is where most of the action takes place. For our table, we use the first dining set we ever purchased as a married couple, as it no longer fits our whole family for mealtimes. The rug was purchased from Overstock. When I saw this rug, I loved it (and it was the only one my husband and I could agree on), but it was a wee bit more than I wanted to spend on a rug – a couple days later, I found it on Overstock for half the price! Score! 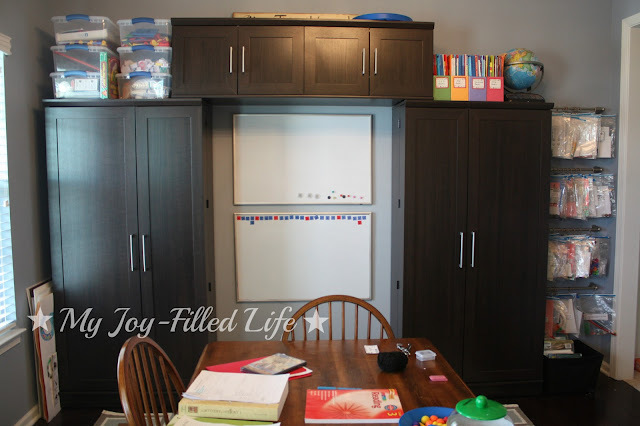 When we moved into our new house, my husband treated me to all new, matching (smile) shelving and cabinetry for the schoolroom. We purchased all of them from Office Max and were blessed to work with the sales manager who gave us an awesome deal. These cabinets provide an abundant amount of storage, and one of the benefits to having cabinets is that I can close the doors and not have to look at the mess! This is how I store our Busy Bags. Guess where I discovered this brilliant idea. You guessed it, Pinterest! The idea came from a blog called Small Potatoes. I ordered the towel bars from Home Depot (the bar and end posts come separately) and the curtain clip thingies I bought at Target. Most of our Busy Bag ideas I get from Pinterest, or I have several books where I get ideas from. 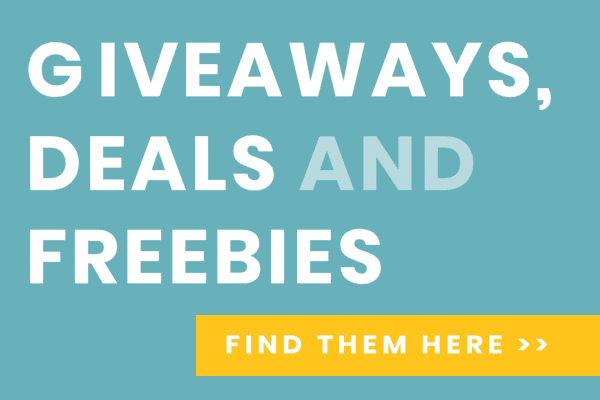 Books that I have used are Activity Bags, 20 Instant Math Learning Centers That Children Will Love, Shoe Box Learning Centers – Math, Shoe Box Learning Centers – Phonics, and Shoe Box Leaning Centers – Alphabet. This is our calendar/bulletin board area. I bought the calendar from Lakeshore Learning (I so miss having that store nearby) and the day of the week/seasons/weather activities to the right of the calendar are from Confessions of a Homeschooler. Most of the posters in our schoolroom come from Trend Enterprises. The Days of the Week and Months of the Year poster I turned into interactive posters. I did this by covering up the words on the poster with cardstock (in a matching color to keep it pretty). Then I just printed up the days of the week and months of the year using Microsoft Word (in pretty, matching colors again), laminated them and used Velcro to stick them to the posters. Now, whoever is working on learning the days of the week and months of the year can remove the labels and put them back on in order (that’s the idea anyways). And as a side note, just to keep things real, I took these pictures in March (calendar time kind of slipped by the wayside this past year). If you are a homeschooler, you can never have enough bookshelves. This little area is an extension of my desk (my desk is in the “living room” which you will see in a minute). 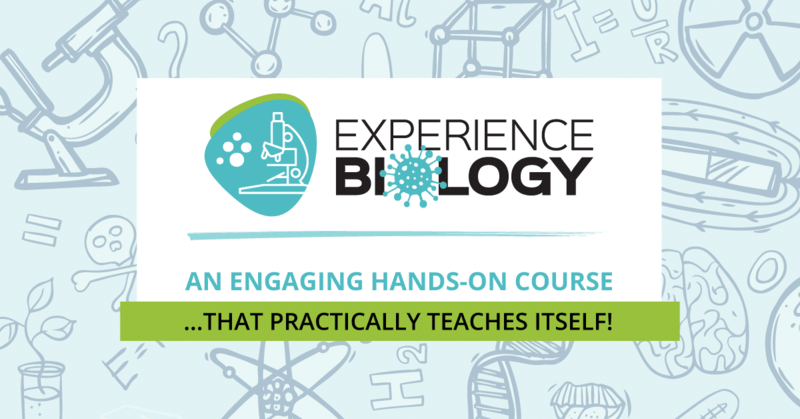 It has all the current curriculum and resources that we are using in it. And here is another Pinterest idea. 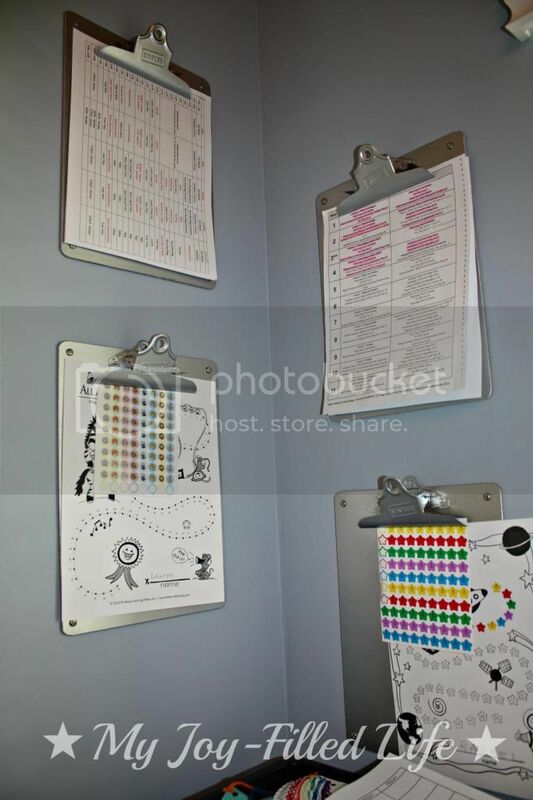 I use these clip boards to hang the girls progress charts for their reading, our daily schedule, and our schedules for subjects that we do together (like history and science). At Clean & Scentsible, Jenn uses them to display her children’s artwork. Through the french doors is the “living room,” AKA – my office and independent work area. Here is my desk. This room is usually messier then the other room – this doesn’t help my case that the kids are the ones that make all the messes. My desk is also the Sauder brand like the shelves and cabinets, only we purchased the desk directly from a Sauder store. More shelving, with too many books (at least my husband thinks we have too many books). A close up of my desk. A homeschooler’s desk wouldn’t be complete without a toy car, a couple of pairs of shoes, and some baby wipes on it. This is where the older boys do their independent work. We bought these two desks at Target; they are just the right size and perfect for our needs. And Mr. Max’s swing is in Mommy’s office to keep him out of harm’s way from his 2-year-old twin brothers. So there you have it, our schoolroom(s). Do you have a schoolroom post? I’d love to see it – share the link in the comments below. 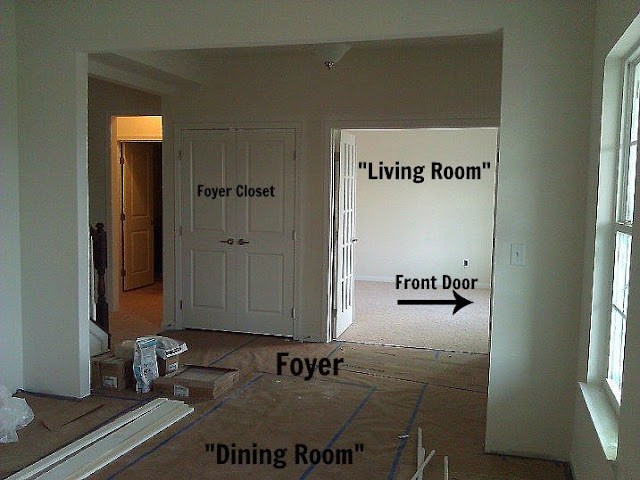 Oh, and in case you are wondering about the wall color, it’s called Calming Space (how appropriate, right?) by Behr. I just love it! Wow! Love it and I so wish we had a schoolroom. Love that there are two rooms close together, but separate (with the french doors to close to the teacher’s room). It’s IS just perfect… and I love the light, airy, cheery colors. I may do a “homeschool room(s)” post next week for my Blogging Through The Alphabet letter “H”, but believe me.. it won’t be pretty! lol. Thanks Clarissa! That reminds me – should mention the color paint I used in case anyone is interested! I just love that color; we used it in our last house too. It’s called Calming Space by Behr. It is gorgeous! Great job!!! Looks great! You’ve inspired me to give our homeschool room a much needed makeover! I’m a new follower, found your blog at the Hip Homeschool Hop. Looking forward to reading more of your posts! Thanks Michelle! Hopefully I’ve given you some good ideas! Glad you are a new follower! Wow! So impressive! If we decide to go the homeschooling route, I will definitely be coming back to this post! Heather – How old is your daughter? 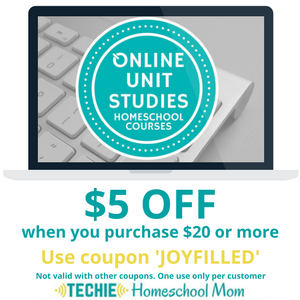 LOVE your homeschool room! We don’t have a school room anymore. We have small house and ended up needing the space for a bedroom. We miss our school room but we’ve learned to adjust. 🙂 Also, I really like the busy bags idea. Ours are a big mess in a basket! 🙂 This will be good to remember for next school year. Just beautiful Sarah! I am coming to do school at your house!!! 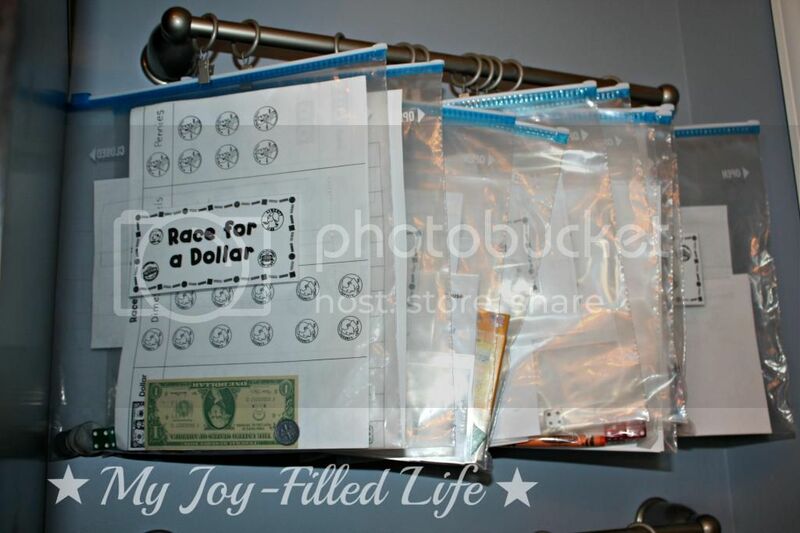 When do your kiddos use the buys bags? Is that a planned time, or for use during a free time? Michele – I do have a spot in our schedule planned for Busy Bags for the younger kids. But they can use them during free time of they choose to. Thank you for sharing:) I love that all your pictures are not perfect, it made me smile seeing your wipes, kids shoes, and a toy truck on your desk! It reminds me of when my kids were smaller…great job on your homeschooling areas! very nice. It looks fantastic. 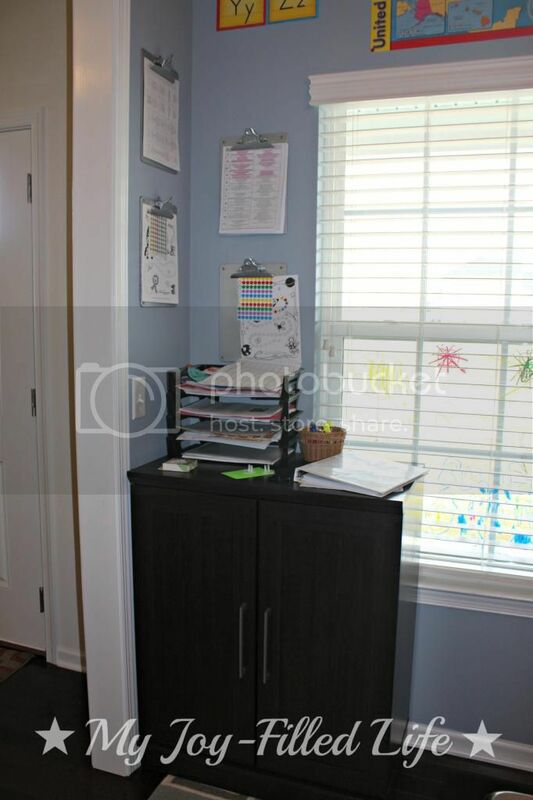 I love how you have the cabinets on either side of your erase boards. That’s really clever 🙂 I also homeschool and we recently remodeled our homeschool room too.. 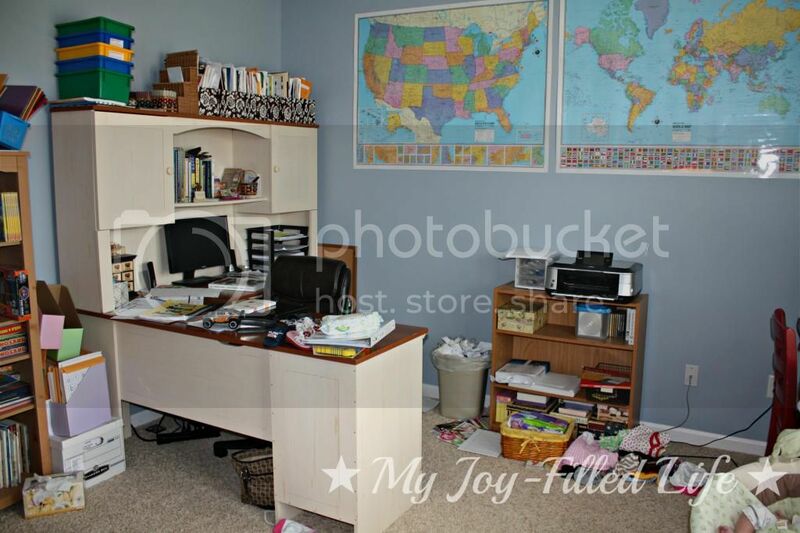 I love checking out other homeschoolers’ rooms and ideas. thanks for sharing. Still trying to wipe the drool… Love it! And I must agree, you can NEVER have enough books! Thank you for sharing the inspiration! Bridget – I do shelf my books by subject. One shelf for science books, history books, etc…. I also organize the fiction books by level of difficulty – all storybooks/picture books together, all beginning chapter books, and so on. In the colored file boxes I have workbooks that I can just pull out for my preschool or Kinder students if I need something quick to keep their little hands busy. One box has letter workbooks, one has math workbooks, and so on. Sarah! This is amazing! I don’t homeschool and I STILL want a room like this! Great job! Great tips, ideas, and I am super jealous of all of your amazing organization, shelving, and beautiful furniture (especially your desk)!! So, does this mean you aren’t moving? 🙂 I miss you…we should get these kiddos together one of these days! Kate!! Why aren’t you on FB anymore? And I hardly ever see you on Pinterest! I miss you too! Yes, we are moving! To Texas! Whenever we sell our house, we will be heading south. And I’m probably going to sell my desk before we move. You can have first dibs!! I love your school room, it turned out so nice! I like all of your busy bags too, I’m hoping to make some for this next school year. Thanks for sharing your pics. Love love love your school room!! I am drooling over your organization and how clean the room is… even if it was just once! ; ) And, The busy bag wall is GENIUS!! 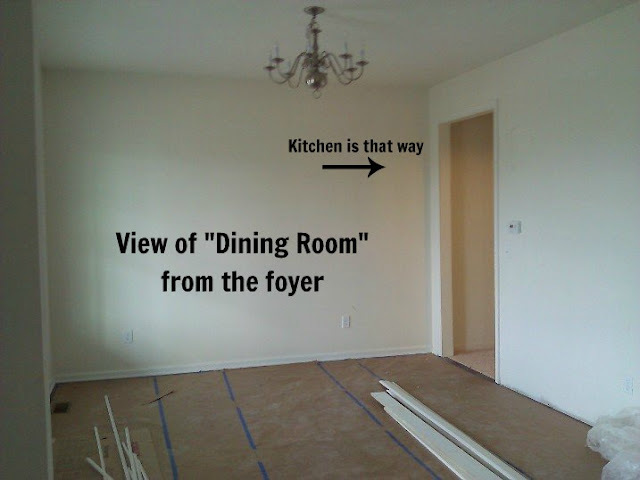 Fantastic idea to use your dining room (who needs one anyway?!) 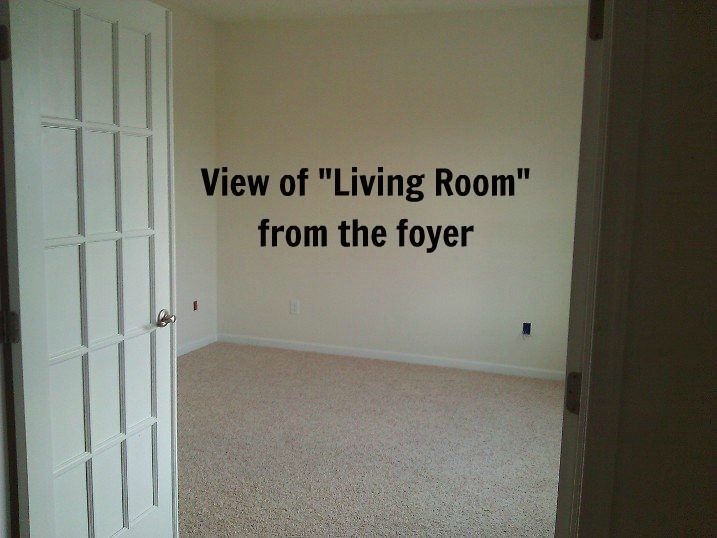 and livingroom. You probably have a family room and why do Americans have two living rooms?! Probably they don’t homeschool, ha! Beautiful!! Thanks for linking up and sharing this over at WholeHearted Home. One word…swoon!! I love what you were able to do with your space! It looks great and I know it will function so well for your family. I wish we had a room in our home for school but we use a part of our family room for ours. If I had a living room like yours I would have done the same thing! Well done! Super awesome!!! I don’t know how you do it all!! Love the room!! Visiting from the Pin Me party!!! The room looks amazing! I’m working on getting mine together this week and next… this will be my first year homeschooling, my oldest is starting kindergarten! I’m super excited! Thanks so much for linking up with Abiding Woman. Blessings! WOW!! I am so excited for you! We tend to just sprawl all over the whole house and have our school paraphernalia wherever we can stash it. Your room is amazing (as I sit drooling! :D) Thanks for sharing this!! That is a gorgeous set-up!!!! Amazing!!! I love it! I bet the cupboards are nice to hide everything and it all matches! Yay! I’m stealing the busy bags organization and the clipboards idea :0) Ours busy bags are currently in a basket, and I already know it’s not going to work. Thanks so much for sharing! LOVE IT! It is very beautiful and functional! I love how everything is set up. 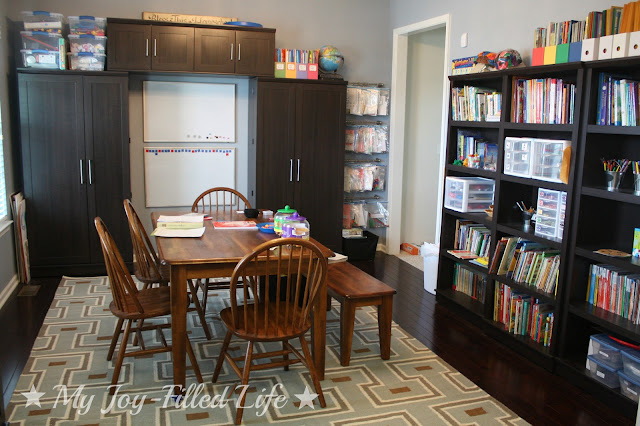 I do love your homeschooling spaces! We’re kind of at the beginning of the end of our homeschooling years! 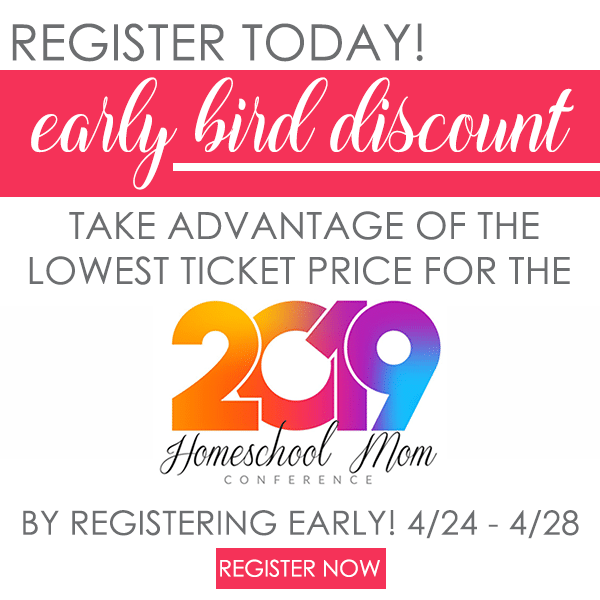 We began homeschooling in 1984 and will “officially” be done in 2019!! 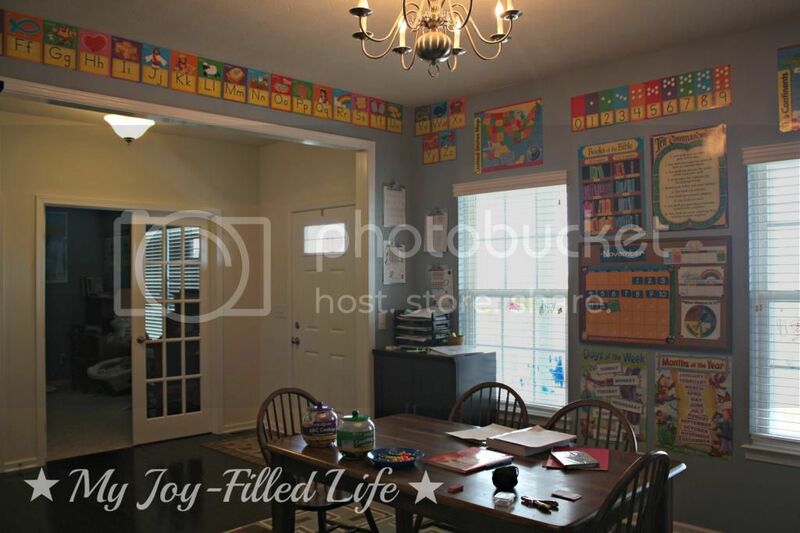 When all the kids were little we had a homeschooling/play room. Now we just have a 17 yr old, an 11 yr old and a special needs 14 yr old at home. We don’t have a designated area anymore! Wow! That’s amazing! You did a fabulous job! I like it! 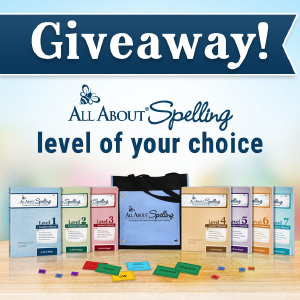 Thanks for sharing on T2T! I LOVE it!!! What a blessing to have all that space and an awesome hubby who treated you to matching organizers! We don’t have a school room because we don’t have any extra rooms, but I could totally live in yours!! This is amazing, Sarah! You are blessed! Thanks for sharing at the Homemaking Party! Hello again! I’m featuring you tonight at the Homemaking Party! Thanks for a great post! 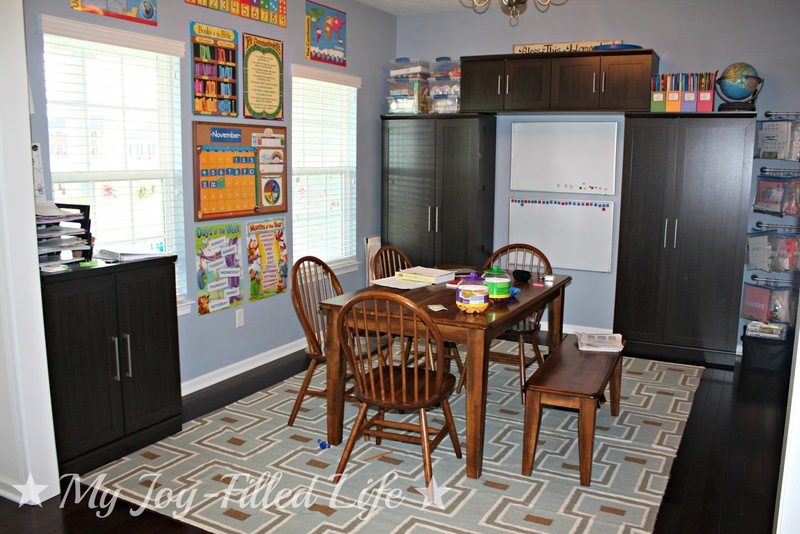 Wow, what a gorgeous schoolroom! I love all the bright colors, how fun! Loved your office too. We never had a specific homeschool room when the kids were younger. We started out with the intention of having one but it seems like we liked the kitchen or sunroom the best. But then I only had two children. 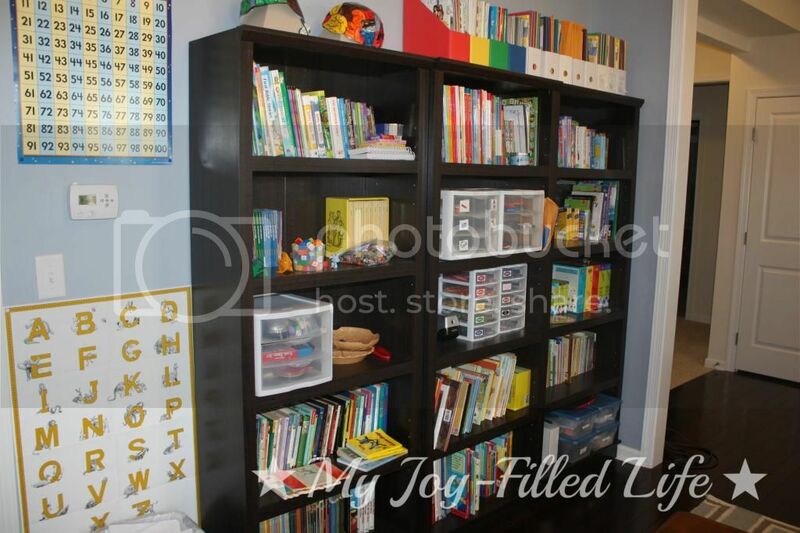 Loved the comment about homeschoolers and their bookcases. My hubby had to help a homeschooling friend move once. He said he had never seen so many bookcases in his life (they had 14 of them), lol! Thanks so much for linking up to the “Making Your Home Sing Monday” linky party! I’m inspired! I am planning a schoolroom makeover this summer (can’t wait!). Found this post through The Ultimate Homeschool Pinterest Party and (re)pinned it from your “Homeschool Room Ideas” board. 🙂 Well done! 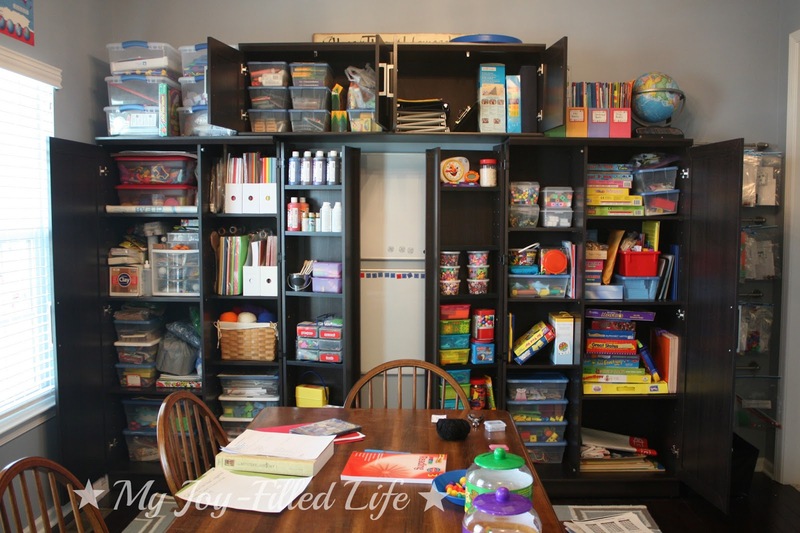 Wow, now this is an amazing homeschooling area! 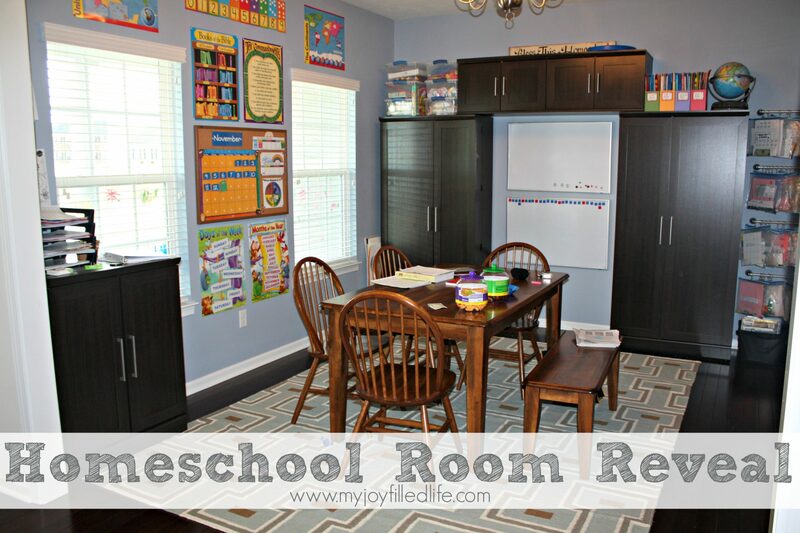 I found you by searching “homeschool room ideas”. I am beginning to homeschool my first, he’s 5.5 right now, and we’ve started K recently. I am so intimidated and nervous about the whole homeschooling thing, but this is what God placed on my heart before we even had children. I trust Him though can’t help but feel completely helpless and lack ideas. Searching through blogs seems to take way too much time to find ideas on curriculum or room decor. 🙂 Thank you for sharing your magnificent homeschooling room and all the beautifully organized bins in the cabinets. How in the world do you do it with your babies (twins, plus one beautiful baby)? I don’t understand 🙂 You are truly blessed. Hi Natalie – I’m so glad you stopped by! Don’t be nervous about starting school. Just have fun and play a lot! Pray each day and ask the Lord for guidance; He will provide for you – even when it comes to school! I’m actually doing a series this week called, How Do I Homeschool With So Many Kids? 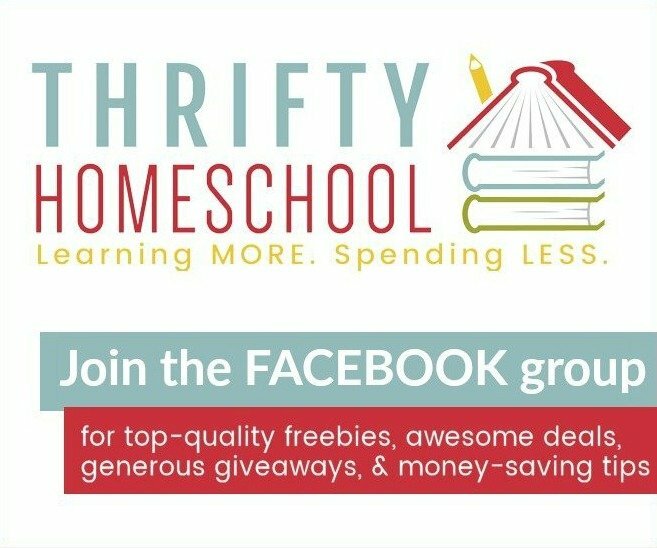 Even if you don’t have a lot of kids, you might be able to find some tips and ideas you can use in your homeschool. I hope you’ll stop by again! Great great great room! Awesome job! Can you tell me where you purchased the faith-based alphabet train along your ceiling? Thanks. I’m pretty sure I got them at Trend Enterprises; I don’t think they carry them anymore; they have some great Christian products. So cool! We had a schoolroom once. Now we are trying to make do with the space of an eat-in kitchen. 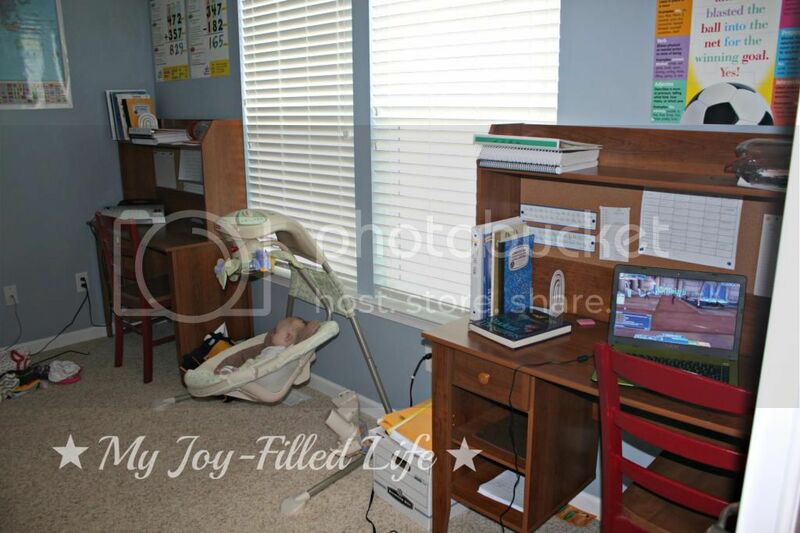 Your room looks wonderful and I love that you have a separate office and place for your kids to work independently. I love the room. I agree that doors are cabinets are great. I didn’t even open mine to take photos. I saw that first picture, and my first reaction was 8-o . Then you said something about a mess, and I’m like, what mess? That was a mess? While I do love the inspiration that comes from looking at a pristine space, I agree that having stuff out makes a space look lived-in and loved. I also loved that you caught the Tinysweet asleep in his swing. Sometimes when you see pictures of people’s living space looking picture-perfect, you miss seeing the fulfillment of a space’s purpose and that warmth of the human presence. I’m guessing by the time I read this, the baby is 2 and the twins are 4 or 5… what a wonderful learning space for all ages. Thanks for sharing! 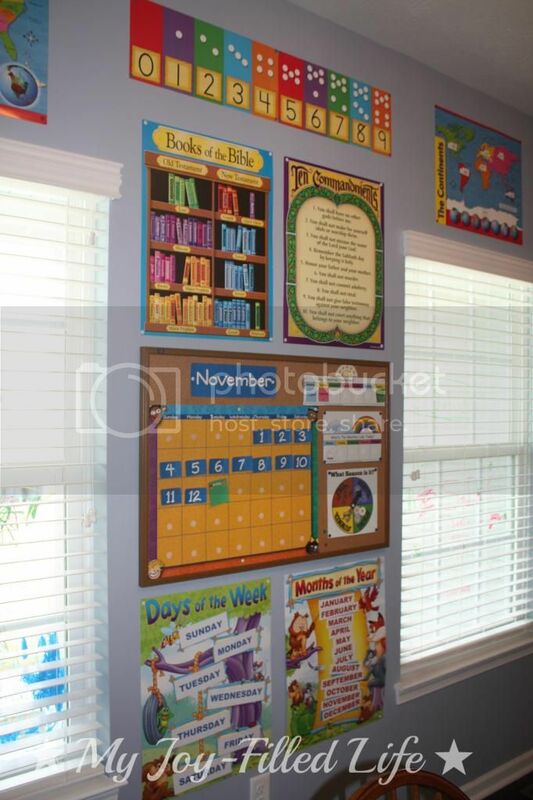 Can you tell me where you got the great alphabet wall cards with the Christian themes that you hung above the large opening in your school room? Hi Jillian – I got them from Trend Enterprises, but I’m not sure if they still carry them.